There was a tournament scheduled at MegaGames at Penrith for Sunday, October 19. However, with only two confirmed entrants (one travelling up from Berry), our ever wonderful hostess, Christine, was forced to cancel a couple of days out. Still wanting to have a flick, Adrian decided to open up his garage for the afternoon. 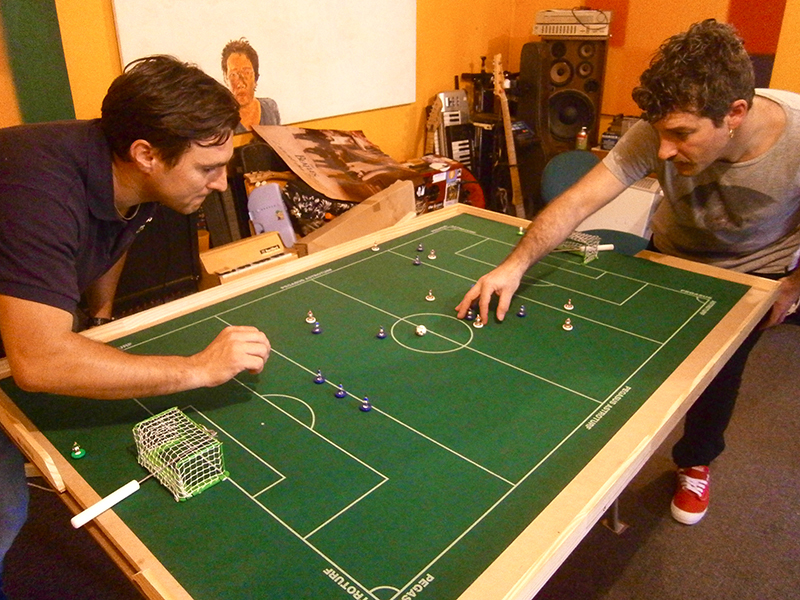 A later starting time than was possible at MegaGames, and being much closer to home, meant that Steve and Gordy were able to join in while Raffaele, the other original entrant, managed to drag along his brother for his first games of Subbuteo in 20 years. 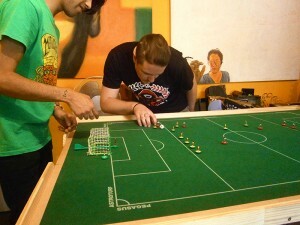 The respectable field of five meant an official tournament could still take place. Steve putting pressure on Gordy. 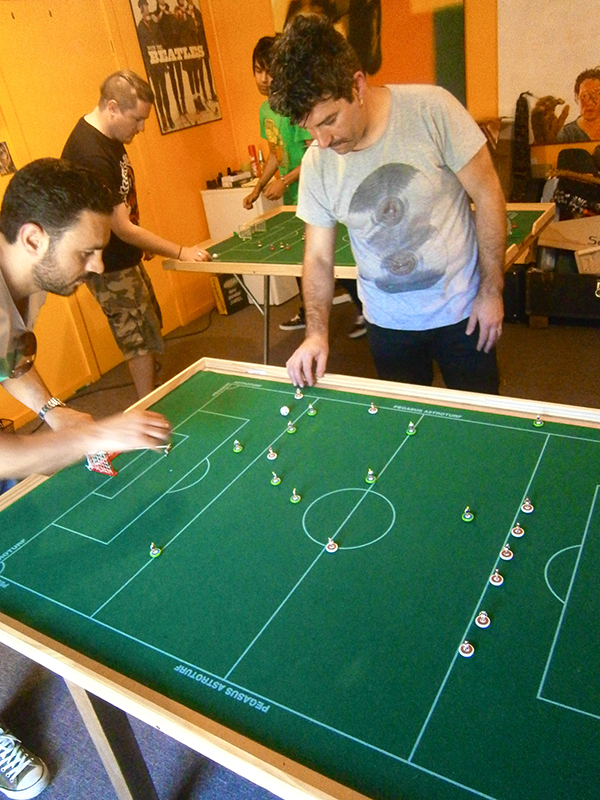 A full league was played, with the Lombardi brothers drawing each other in the first round. To everyone’s surprise, including his own, Daniele took an early lead, quickly refinding his touch. 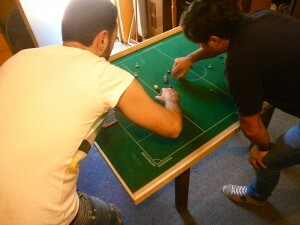 Raffaele had to dig deep to graft out a hard earned 2-1 victory by the final whistle. 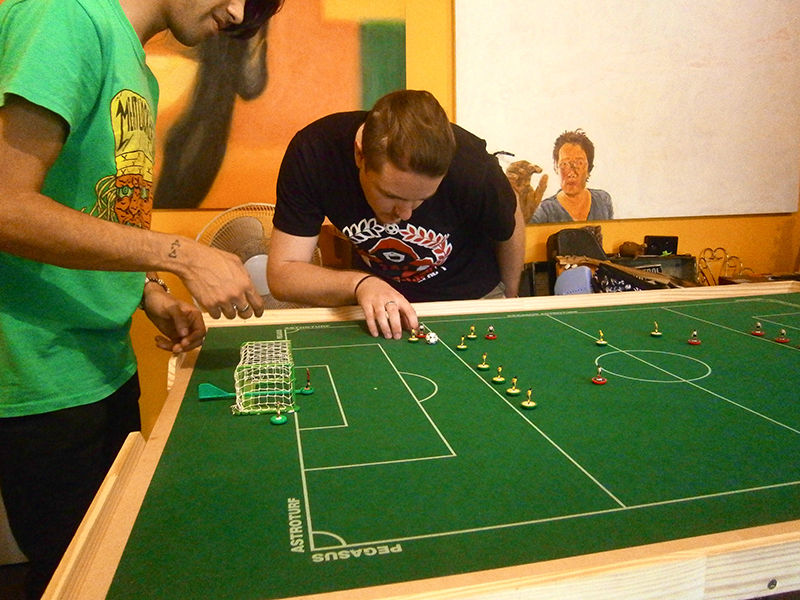 The games across the afternoon were all tight with no scoreline blowouts. Highlights included Daniele scoring in the opening 15 seconds against Adrian with a sublime series of moving ball passes and shot, and an all out attack minded game between Gordy and Steve, where both players were only let down by poor finishing before Steve slipped one in to take the victory. Adrian trying to equalise against Daniel. At the end of the league, Raffaele came out on top with a perfect win-loss record, followed by Adrian, Steve, Daniele then Gordy. Keen to keep playing, a finals series was set up, 1v4 and 2v3. This is where the day’s most intense game took place, with the Lombardis going at each other again. As Italian profanities flew about the room, the two couldn’t be separated by full-time, so extra time was needed. A few minutes in, Raffaele managed to carve a space for a shot, only to see it kept out by Daniele’s ‘keeper. However, the shot was called back for a goalkeeping infringement (the ‘keeper being outside his area) and Raffaele made no mistake, a devastating way for Daniele to relinquish bragging rights over his big brother. In the other semi, Adrian ground out yet another 1-0 win over Steve (the third such result in competitive matches in 5 days!). However, Raffaele made it 6 wins from 6 games with a 2-0 victory in the final, repeating the score he had beated Adrian by earlier in the afternoon. Brother v brother as the tension builds. The finalists go at it. A fun afternoon salvaged, with another promising new (old) player joining the ranks. This entry was posted in News, Tournament reports and tagged adrian elmer, daniel lombardi, gordy dudley, raffaele lombardi, steve diasinos, waspa on 19/10/2014 by ajebec.